Following up to the reveal of Jason Voorhees, Warner Bros. and NetherRealm announce the other three characters who are part of the Kombat Pack : Predator, Tremor and Tanya. The pack also contains some skins. Wow, this is quite awesome. Might get me to actually preorder this thing. Really curious about Sonya's klassic skin. Brilliant character choices that just suit MK to a tee. I was going to suggest Freddy Kruger, but he's already been in it before, hasn't he? I just want to see Predator in action! 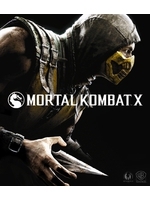 Well played Ed Boon, MKIII already pretty much had composite parts of the BMX ninjas with Predator moves... now its official. Jason and Predator are all I need. Not sure who the other two are.